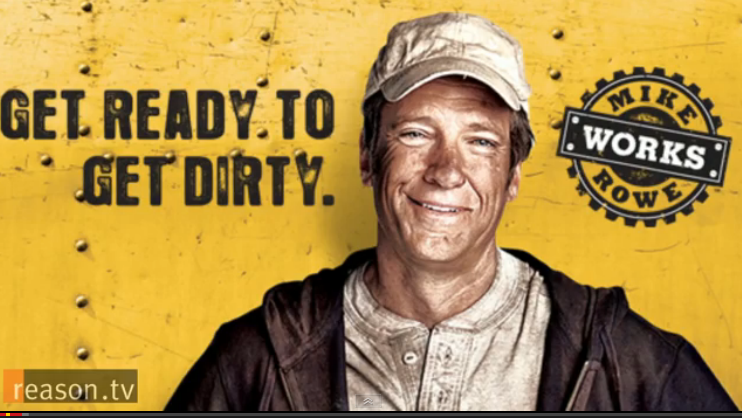 Mike Rowe, host of the Discovery Channel series Dirty Jobs chimes in on the US education system in an interview with Nick Gillespie on Reason.Com. Rowe: If we are lending money that ostensibly we don’t have to kids who have no hope of making it back in order to train them for jobs that clearly don’t exist, I might suggest that we’ve gone around the bend a little bit. Gillespie: We are doing everything we can to push every kid to go to a four-year college. What’s wrong with that? Gillespie: What do you mean a skills gap? Rowe: Right now you have about 3 million jobs in transportation, commerce, trades, that can’t be filled. Rowe: [interjects] Heating, electric, truck drivers, welders is a big one, jobs that typically parents don’t sit down and say to their kids – look if all goes well, this is what you are going to do. Rowe’s advice is summed up in the following clip I took from the video. The video is a lengthy 41 minutes but Reason.com provides this synopsis so you can skip to topics that interest you.